Wolcum Yole, Puppyfriends! As a special treat to all the boys and girls who have been good all year we have spent the last month working on completely free DLC for Revenge of the Titans! All you need to do is make sure you install the latest v1.80.14 release (download the demo from our site here if you’re a Puppygames customer, or go to your Humble Indie Bundle download page, or just fire up Steam and it’ll update automatically). You’ll find that between 19th December and 8th January there’s a new game mode available – Yeti Attack! You get all the toys in the game, albeit in limited numbers, and you can even use disruptor towers safely! The objective is to survive for exactly 30 minutes of a constant stream of Hoff Yetis arriving from the north. The maps generated are completely random so there should even be some good replay value in there as well. Afterwards you will be treated to some amusing statistics. You guys are beyond awesome. Thank you! when i click restart game on the the xmas special it greys out all the tech. i keep on accidentally dragging the screen when trying to sell or perform other quick operations. haven’t gotten used that yet. Ah rats, bug noted. Will get that patched when I can. Additionally, clicking to restart with a different level seems to do nothing. Er yeah seems there’s a wee bug. I’ll fix it after Xmas. In the meantime just restarting from the title screen does the job, albeit always with a newly generated level. That’s brilliant thanks but why is it time limited? Will it unlock every year at the same time? hmm got any commandline params on it or is it vanilla? Vanilla – tried to record a video in FRAPS of the problem but it seems to start a new movie every time the window resizes – weird – maybe it’s related? PS – I also have a funky multi monitor setup at work – I’ll try later at home. Oh gawd, the last Megayeti killed me and he had barely any life left. But it was a blast 😀 Something like this would make a great DLC, maybe with a little campaign and extra special weapons. I would buy it instantly. Hopefully you’ll like Justin’s Sandbox Mode DLC then 🙂 When it’s finished. Hope you’re aware a lot of steam users are unable to update their games past .13 for some reason. I have a feeling Valve are holding it back to coincide with some marketing announcements. hahaha! very clever addition! thanks cas. bought another copy of the game for your trouble. ^^ puppygames make great gifts for those with little time, but need their blasty twitch fix. near the end the screen shaking slows down the game a good deal on my computer, it’s an older computer so it’s probably not a biggie. i’m having issues with getting to the “sell” button quickly. i sometimes miss it and yell a lot. i know i can use the delete key – i’d love to reconfigure that so it’s closer to the the scrolling wasd keys. a right click on nothing to activate selling would be cool too. Middle mouse button does insta-sell. will try that. i have a four button mouse ball thing. The crystal spawning seems to be buggered — crystals may spawn in a spot which can’t be accessed with refineries because of rocks and such., then eventually all crystals end up there once they expire elsewhere and reapawn. It may have always done that… though crystals never actually “expire” or “respawn”, there’s just a slowly decreasing interval over which they are continuously created. I suppose if you get seriously unfavourable terrain your only option is to generate a new level. It’s an awesome mode, great to have the chance to test all of the available technologies (I’m still stuck on the campaign :S), and pretty fun. Now that I’ve came back to RoTT, maybe I’ll give the campaign another try. Looking forward for more new modes! I just tried out the Steam version for Windows, and the version number reports 1.80.15. Is there a difference between that and 1.80.14 for Linux? Should I expect the humble bundle Linux version to be updated in the near future? Srsly? This Achievement is INSANE! I bought this Game cause its fun, but this? No guys… this is not fun at all! Er, are you just standing by the side of the road throwing snowballs at them, or what…? Frankly, this mode is extremely simple once you put a little thought to it. The end is quite frantic, but with standard effort they does not destroy your defences quick enough to make you loose. I’ve been stuck at the campaign for quite a while and I found this new mode both refreshing and easier to accomplish. Just make sure you mine enough minerals and all of the technology is at your hands. Try different approches, vary your weapons, use other defense mechanisms. Is there some way to get more laser turrets / supplies throughout the challenge? I’m afraid not, it’s a single load-out and you need to make do with what you have as best you can. There are occasionally drops of extra barricades and mines though. I defeated all 4 Ultra-Yetis but didn’t get the Drunken Family Argument achievement. Got “SPROUT FLATULENCE”. Bug? Or did I miss something specific? Woops – it did get a little bit broken, yes. I will endeavour to fix it in the next patch. Also broken are the viewport coordinate switches as well. 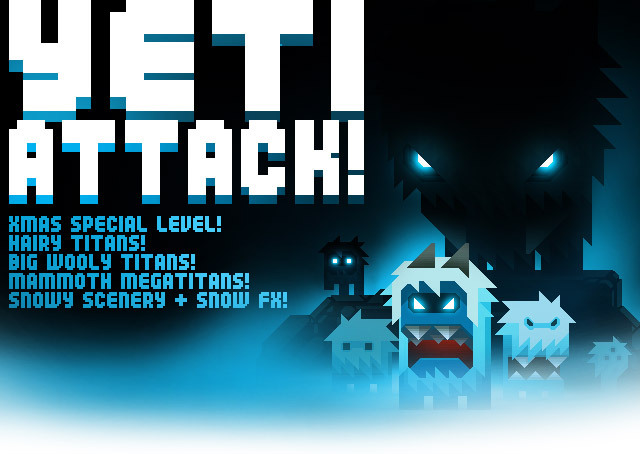 I have finished Yeti Attack, and it’s pretty cool. Thanks! The new scrolling controls were a major pain at first, then I got used to it, but the old way still feels better to me, especially because of the powerups. I’m glad I still have the old installer. If I bought the game on Steam, it wouldn’t be an option. As the new mode gets more and more difficult, you get to use different skills/weapons you have, so it feels like a condensed version of the main campaign – perfect for those of us who wanted to revisit it. Difficulty is in line with the main campaign, and it’s good. However, the gift pile achievement is way too difficult, especially for new players who don’t yet have the skills. The first two or three big yetis would be a better choice. I admit the old scrolling felt nicer most of the time, it’s a shame we just don’t seem to get the data from the LWJGL display that we’re expecting to make it work smoothly or reliably everywhere. But then it’s kinda like when Mac OS suddenly inverted the scrollwheel… after a short while it feels the natural way to do things. Agreed about the gift pile cheevo; I think I’ll ask Valve to switch the requirement to the first 3 yetis and leave the other two for glory. Is there a forum or something (besides here) where RoTT strategy is discussed? http://rott.wikia.com/wiki may be a good start. If it’s not clear or not what you search, please comment, since at least one of the contributor make regular update. i often end up scolling when using the capacitors, which can be very frusterating. beyond that i’ve gotten use to the new way. That’s why I always use the right mouse button to scroll. It always scrolls. no i get the various ways to scroll. i strictly use the wasd keys. but what i meant was when targeting the titans that get close to a capacitor i end up scrolling rather than killing the titan. if you accidentally click the capacitor you’ll get scrollage. anything inside of the capacitor range shouldn’t trigger scrolling unless you’re right clicking – is my long winded suggestion. Sounds like a bug report rather than a suggestion 🙂 The capacitor should always fire if you click inside its range. There are probably a few edge cases I didn’t consider (out of ammo, moving mouse into range from outside, moving mouse out of range from inside with button down and back again, etc) because I kinda solved most of them with RMB scrolling. I’ll have a look at it anyway. What about us direct2drive customers? Is there any way we can get this new version? I’m stuck at 1.80.12, so no yeti attack for me 🙁 . Also, is there any chance i could get a key to activate my copy of RevengeoftheTitans in steam? Thanks in advance. The Yeti attack is active even in the demo from Puppygames 🙂 So just download it and have a play. D2D are going the same way as Desura. I think D2D will have to wait until I get an autopatcher made, and then I’ll release that to D2D and never have to worry about it again. Well, the problem is that the percentage of players who killed 5 yetis is roughly the same as the percentage of players who killed just 1 – and much higher than the percentage of players who killed 2, 3 and 4. Roughly 2/3 of players who have killed five yetis did that without having killed 3 or 4 – and that’s almost certainly cheating. How do you view your stats and compare them vs other players? For example Evgeny mentions how players have killed a certain number of Yettis. We never implemented that for the Xmas bonus mode – didn’t have time – so basically you’ll want to post your scores somewhere. Xmas mode will vanish in 4 days though. How do I find my highscore ingame? I’m a newbie! (but pretty good by the sounds of things, I think I’ve done 4 yettis). I find the earth survival the hardest! I have only got 14 mins but on saturn I have 26. Is that normal? It depends what tech you have – there’s a super-deep complex metagame in Survival mode in that the tech you kill the planet boss with is the tech you have for survival mode. Which might make your choices interesting as some tech is totally geared towards survival mode (eg. droids, repair drones, shield generators, and the like). You might have to create a new slot and try going through Earth again but choosing tech for survival hiscores…! I see!!!! I thought that the unlocked tech came as you progressed through the game. So THAT’s why I struggle on the earth level.